Between titles like Heroes of the Monkey Tavern, Crawl, and Yodanji, the Switch eShop has been hit with all manner of dungeon crawlers as of late. If you’re a sucker for stone walls and narrow corridors, the Switch has likely become your console of choice, and Hammerwatch seeks to join the ranks of these epic adventures with a more multiplayer-focused Gauntlet style approach. Is this dungeon worth exploring, or should would-be adventurers steer clear? In Hammerwatch you choose one of seven classes (Paladin, Wizard, Thief, Priest, Ranger, Warlock and Sorcerer) and attempt to either scale Castle Hammerwatch in search of legendary treasure or infiltrate the Sun Temple to purge it of a foul corruption. The controls are as accessible as can be: you move with the left analog stick and rotate your character with the right. ZR activates your normal attack, while the ZL activates a special move specific to your class. These special moves (such as quickly dashing in the direction you’re facing for the Paladin or shooting a laser beam as the Priest) will drain your mana power, which recharges over time or can be instantly refilled with mana crystals found throughout the game. The combat itself is about as simplistic as the controls. Enemies will chase you with reckless abandon once you come within a certain distance and almost all can be disposed of with just a few attacks. In fact, the enemy AI is so mindless I often found myself running around to attract as many enemies to my position as I could, then spinning towards them and mashing the ZR trigger to swiftly clear them all out. There are monster spawners that force you to get a bit more proactive if you want to clear a floor of baddies, but I found that moving in constant circles while slashing/shooting at the enemies and spawners was almost always an effective strategy. Throughout each dungeon you’ll find vendors who will sell you potions or permanent upgrades to your character. You’ll want to break as many wayward barrels and crates you can to find coins, as obtaining these upgrades are a matter of life and death. Annoyingly, I’d often find a vendor with skills I needed while I lacked sufficient funds and other times I’d be awash in riches without a single vendor in sight. Luckily you can return to previous floors at any time you’d like to pick up that heath expansion you didn’t have enough coins for 30 minutes ago. While the game is entirely playable in single player, it’s multiplayer where Hammerwatch really hits its stride. Players will have to intelligently decide which player most needs heath pickups, avoid attracting more enemies to your position at once than your team can handle, and balance out their team character makeup. Online multiplayer is unavailable at the time of this review’s writing (the development team promises it will be patched in at a later date), but local multiplayer is included, and the controls are simple enough that anyone can grab a second Joy-con and join in the adventure. Graphically, Hammerwatch isn’t much to look at. Its pixel art graphics are reminiscent of MS-DOS games of the 90s, and the game carries a very generic fantasy theme throughout. Bugs, worms, skeletons, and bats make up just a few of the extremely imaginative enemies you’ll find across each level. It would have been nice had the developer made the enemy types a bit more different, but as it is, each baddie feels like a reskin of the next. It doesn’t help that the low-res pixel aesthetic means enemies are generally made up of two or three different colors. The soundtrack is nothing to write home about either – I hope you like the songs that play in each dungeon, because the same song plays endlessly in each dungeon regardless of the floor. 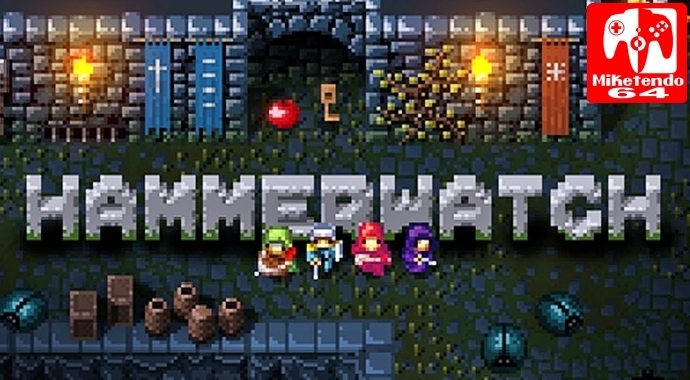 Weak presentation aside, Hammerwatch is a fun budget priced dungeon crawler in the style of Gauntlet and Dungeon Explorer. While it’s still playable in single player, this is one dungeon you’ll want to tackle with friends through local multiplayer, and the simple combat and controls should make it easy to convince even the most inexperienced video game player to join in on a multiplayer session.